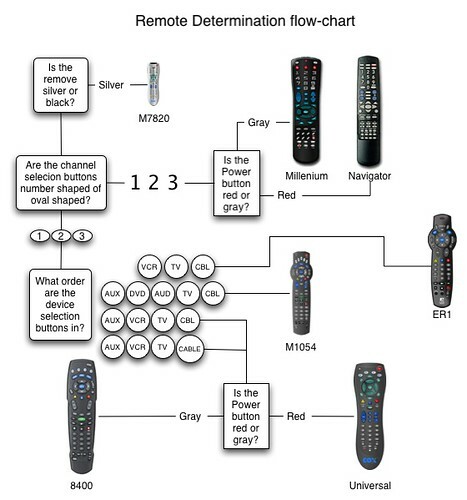 A Flowchart I created to quickly determine what remote a Cox customer is using. All Time Favorite: Hey this isn’t a photo is it? But I saw it in my photostream…I worked for a cable company for a whopping 2 weeks, and one of the most troubling things we would have to do is try and figure out what model remote a customer had, so that we could help them reprogram it or whatever. I made myself this flowchart, or "Job Aid" in call-center lingo, so that I could figure out, in 4-questions or less, which remote people were using. I hated that job.